We talk about preventative maintenance a lot because it’s the best way to keep your garage door working properly and warn you of potential repairs. Plus there are other types of maintenance, like organizing and cleaning, that keep your garage functional and safe. Different types of care are required at different times of the year so, to make it easy, we broke down the different maintenance you should be doing every season. Routinely inspect your door’s bottom seal. This is the part of your garage that keeps water, debris and animals out and it’s also the part that is the most likely to ice up in really bad conditions. Take a look at it throughout the season to make sure it is doing its job. If it’s cracked, falling off, or sticking to the icy pavement, give us a call. Perform a visual inspection of your door’s other parts. Take a look at your garage door springs, rollers, cables, and other hardware looking for signs of wear, rust or debris. If your door is shaking or groaning now, you won’t want to wait until spring or summer to have it professionally inspected. Thoroughly clean your garage door. Your door protected you all winter long from the elements so it’s probably looking a bit shabby. Use a mile soap, warm water and a soft bristle brush to gently scrub the panels. You never want to use abrasive or chemical cleaners as they can scratch your door. This is a great time to do a quick check of the door opener, tracks and springs. Reorganize your garage’s interior. 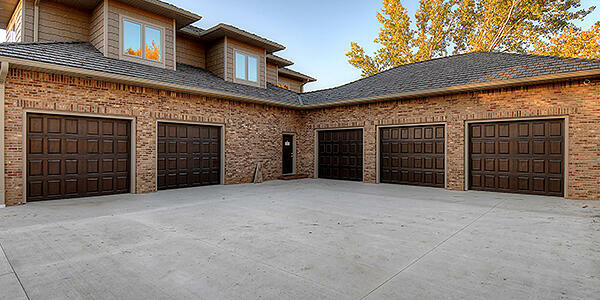 Spring is the perfect time to reevaluate the function of your garage. Determine if new storage bins would better suit your purpose, or install more shelves or a peg wall for tools. Bonus - the tidier your garage, the easier it is to move around in it to perform routine checks. As you are reorganizing, throw out the items you don’t need, haven’t looked at in years and are just plain garbage or sell them at a garage sale. Check your garage’s insulation. Insulation is the key factor to keeping your garage cool in the summer and also warm in the winter. Insulation in the walls, ceiling and even the garage door provide significant benefits and help reduce energy costs. Overhead Door of Sioux City and Yankton™ has a selection of insulated garage doors that are available in nine colors and three wood grain finishes. Ask for a free quote about a new door. Any time is a good time to buy a new garage door but the nice weather makes summer especially appealing. Overhead Door of Sioux City and Yankton has tons of residential garage door options to choose from, many of which are customizable. Our doors are also warrantied, making your preventative maintenance jobs easy for years to come. Schedule a garage door checkup. Maybe you noticed some extra wear-and-tear from the previous seasons, this is the ideal time to have it repaired – before another winter arrives. The professionals at Overhead Door of Sioux City and Yankton™ can inspect your garage and tell you if anything needs to be fixed or replaced. Test alarm devices. Fall storage prep a great time to test garage alarm devices like smoke, carbon monoxide and heat detectors. Also check your fire extinguisher and inspect that it hasn’t expired. Don’t have any of these devices? We strongly recommend you go out and buy them as they are essential to keeping your home and family safe. At Overhead Door of Sioux City and Yankton, we work every season, rain or shine. Don’t hesitate to contact us if you have questions, comments or need an immediate repair to your door. We’re there when you need us!